IMG_3155.JPG, originally uploaded by Temeculamom. Well, we are continuing to be busy around here. 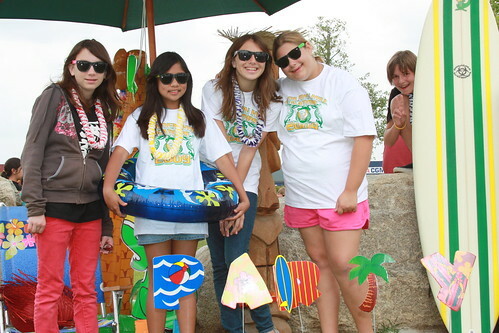 This is a shot of Isabella (second from the right) and her three best friends at their 6th grade graduation party. It was a pool party at a nearby park, and they had a taco bar cater it, so the food was fantastic too. The next day a friend threw a party at her house for some of the kids. Just a small afair for 60 or so! Then Zachary had his guitar recital at the House of Blues. It was like a real rock concert. They played Boulevard of Broken Dreams by Green Day and Holiday by Green Day. Other classes played songs by the Beatles, The Rolling Stones, GNR, and more. Afterward, we got a big table, and a bunch of us grabbed a yummy meal and hung out for a while. The guy with Zachary is his teacher. How awesome is he to get the kids a venue like that for their recital? ~ by bekaboo on June 18, 2009.